This summer, wear something for your nails that instantly changes color in the sun the moment you walk outdoors then changes back once your indoor. Now that’s wearing two colors and you just have to pay for one! 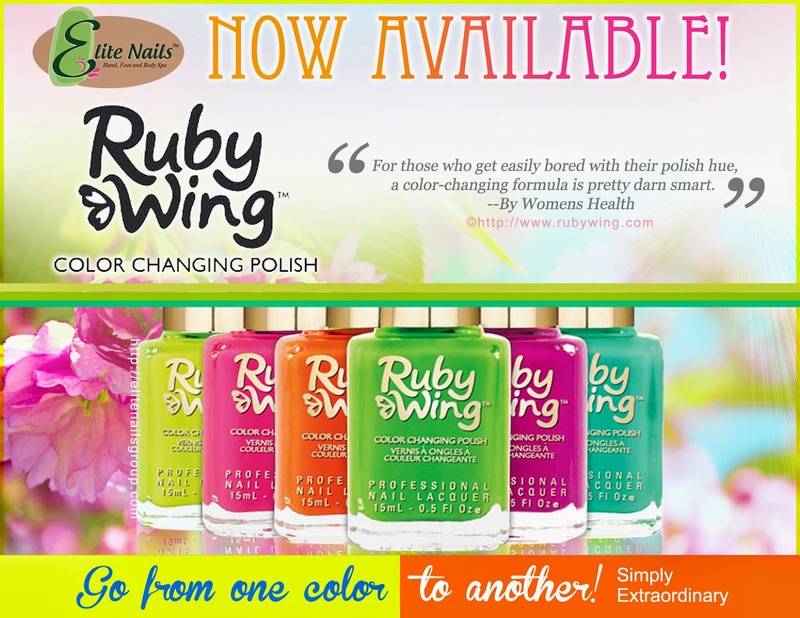 Elite Nails & Spa is bringing you what everyone seems to be obsessing worldwide – the Ruby Wing’s Color Changing Nail Polish! What’s so special about Ruby Wing? Well, this new brand of nail polish utilizes the latest and greatest in color changing technology! Instead of changing with temperature like a lot of color changing polishes do, these change with UV. And because every nail lacquer produced by Ruby Wing features Solar Active technology, all you need is a little sun light to change up your look! Now, how cool is that? You’ll surely be impressed how quickly each color change in between time when you stepped out into the sun and then back into the shade. And every bottle comes packed with two great colors sure to leave a lasting impact on friends, co-workers, and family. Aside from the amazing color-changing technology, Ruby Wing nail polishes meet all safety and environmental requirements; DBP, formaldehyde, and toluene free plus they’re vegan and never tested on animals. Let Ruby Wing's UV color changing nail polish line change your mood with smiles from the magic of color change and create dramatic transformation for your hands instantly! You can already try these lacquers available at our Kapasigan branch. Watch out for additional collections coming soon and their availability to be announced!